Welcome to the Central Library of Modern College of Arts, Science & Commerce, Ganeshkhind, Pune 16. Myself Dr. Sangeeta Dhamdhere, Librarian, Modern College of Arts, Science and Commerce, Ganeshkhind would like to welcome you all for this online information literacy program. To maximize utilization of library resources. Our college is multi-faculty college and so is our library. The main purpose of library is to freely disseminate knowledge, support teaching, research and academic activities and ignite the minds of youngster studying in our college. Our Library is one of the vibrant learning units in our college. 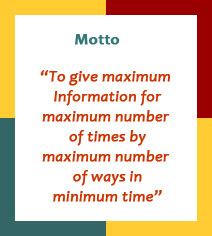 All library staff works with the motto “To Give Maximum Information for Maximum Number of Times by Maximum Number of Ways in Minimum Times”. Library operates on need based approach rather than the usual rules-based treatment. We are giving technology based services and facilities such as Web-OPAC, reference service for searching information from online databases, e-books, e-journals, consortia, audio books, library e-newsletter, online information literacy programs, library Blog, Online Brochure, digital library, Internet facility, Urkund- an anti-plagiarism software along with other open source tools available for research scholars, computerized issue return and attendance through barcode scanner, etc. At the same time we also provide traditional services such as reference and referral service, current awareness service, bibliographical services, reading facility, book bank facility for needy students, institutional membership of other libraries, inter library loan and library orientation programs, etc. We have a huge collection of books which includes reference, text, self-help, personality development, biographies, autobiographies, success stories, novels and competitive exam related books in our library. We subscribe national and International journals and magazines and provide gateway to many online scholarly publications. Every year library organizes book exhibitions; guest lectures, celebrates birth anniversaries of eminent personalities, conducts various competitions and other programs to inculcate reading habits among the students. Through library website and web-OPAC library is accessible to users for 24/7 from any location. Library has its active Facebook page to circulate notices and updates. I invite you to take advantage of this treasure of knowledge we have made available to you. Your positive and healthy suggestions are welcome. Please let us know how we can assist you. In the tsunami of information, library staff teaches you to swim. I hope the library resources, services and facilities will be helpful to you. Library operates on need based approach rather than the usual rules-based treatment. In order to fulfill this motto and make maximum use of library resource this wiki is been created to educate patrons online.